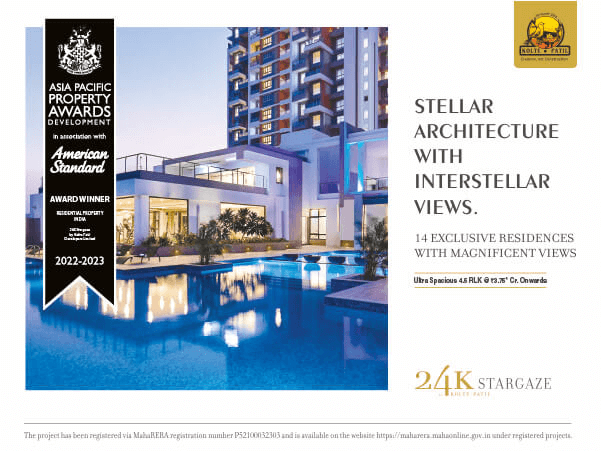 Spacious, luxurious and a class apart – A 24K home is not just a property or an apartment. It is an experience that takes your lifestyle notches above any other. For some it is a statement, for many it is a sense of achievement. Whatever be the reason, we at 24K believe that this ultra-lavish experience should need no waiting. Which is why our 24K projects are now available on lease. Moreover, you can find your plush haven without any worry because we put our customer's satisfaction at the highest priority and completely abide by the MahaRERA rules and regulations. So, get ready to live exclusively. The joy of living the high life is only a call away. Contact Nilesh Telkikar - +91-9765571000 for all lease related queries NOW! For any other 24K homes related information contact us on 7066024000. Please fill out a quick form and we'll be in touch with you at lightning speed.